LESC celebrates opening of new Diversity Works housing residence. ACS took part in the formal ribbon-cutting ceremonies with Deputy Mayor Linda Gibbs represented by Eric Nicklas, Associate Commissioner for the D1v1sion of Family Permanency Services. "Keeping Families Together will benefit families that are chronically homeless by meeting their complex needs, which also can lead to higher incidents of child neglect or abuse," said Nicklas. "This program provides stability to these families at a critical juncture in their lives. In the coming months, this program can serve as a real beacon for families looking for a stable home life and the support they need to grow stronger and safer for their children." 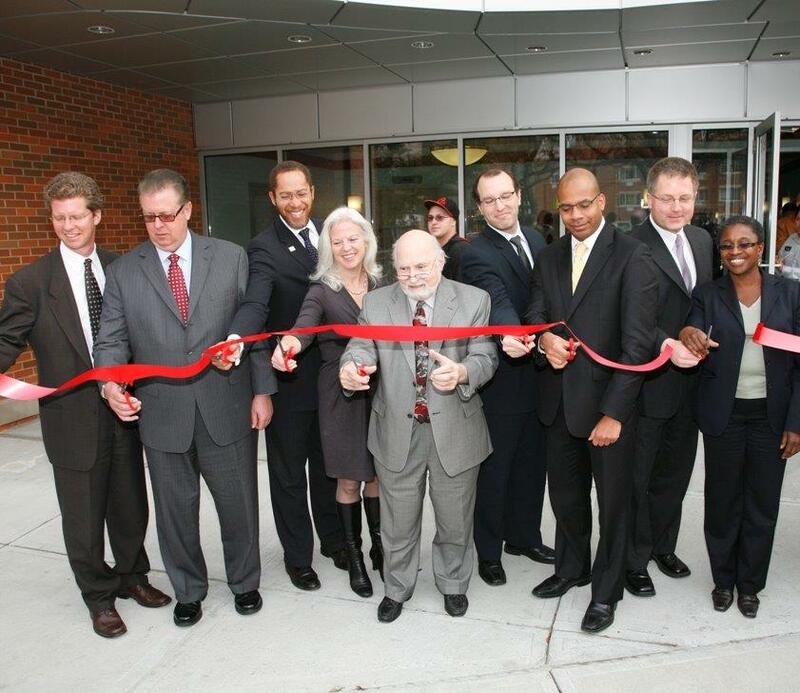 The City formally unveiled the opening of Diversity Works, an affordable supportive housing development for formerly homeless families in the Bronx on November 12, 2008. In addition, several families in the new housing are taking part in an innovative program as part of Diversity Works called Keeping Families Together. This program combines permanent supportive housing with family preservation services. Eligible families must be chronically homeless and have a high risk of out-of-home placement for their children. Children's Services, the Department of Homeless Services (DHS) and several non-profit providers support the design and implementation of this program by the Corporation for Supportive Housing. ACS took part in the formal ribbon-cutting ceremonies with Deputy Mayor Linda Gibbs represented by Eric Nicklas, Associate Commissioner for the D1v1sion of Family Permanency Services. "Keeping Families Together will benefit families that are chronically homeless by meeting their complex needs, which also can lead to higher incidents of child neglect or abuse," said Nicklas. "This program provides stability to these families at a critical juncture in their lives. In the coming months, this program can serve as a real beacon for families looking for a stable home life and the support they need to grow stronger and safer for their children." Currently, about 45 families are l1v1ng in the spanking, new high-rise located in the East Tremont section of the Bronx. This will be their permanent home as long as they meet eligibility requirements. Mayor Michael R. Bloomberg today announced the opening of Diversity Works, an affordable supportive housing development for formerly homeless families. Supportive housing-permanent affordable housing with on-site services-is a demonstrated solution for preventing homelessness and helping individuals transition into the mainstream. Comprised of 42 housing units and located In the Crotona section of the Bronx, Diversity Works is the first such housing development completed under New York/New York III and funded by the City. One hundred percent of the units have been dedicated for low-income families, or those earning up to 60 percent of the HUD Income Limits, which is equivalent to a salary of $46,100 for a family of 4. Deputy Mayor for Health and Human Services Linda I . Gibbs was joined at the announcement by HPD Commissioner Shaun Donovan, Homeless Services Commissioner Robert V. Hess, Administration for Children's Services Family Permanency Associate Commissioner Eric Nicklas, Health Department Mental Hygiene Executive Deputy Commissioner Adam Karpati, Lower Eastside Service Center CEO & President Herbert Barish, Enterprise Community Partners, Inc. as well as other supporters. "Diversity Works moves the City closer to fulfilling our commitment to creating supportive housing for the neediest New Yorkers and encourages those most in need to take advantage of the onsite supports available to them," said Mayor Bloomberg. "Homeless families and the longest-term shelter-stayers with the most complex barriers to housing, such as a dual diagnosis of mental illness and substance abuse will be the primary residents." "City agencies have taken this challenge head on and have strengthened their partnerships with organizations like the LESC, Enterprise, and CSH to adapt supportive housing, a nationally recognized and effective tool to help our most vulnerable residents," said Deputy Mayor Gibbs. “And by implementing innovative programs like Keeping Families Together, we are expanding the potential impact of our efforts continuing to fortify households, neighborhoods, and our city." "Resident s of supportive housing, tax payers and local neighborhoods all benefit from a supportive housing approach to ending chronic homelessness," said Commissioner Donovan. "Tenants have the opportunity to achieve concrete goals and build essential support networks. Supportive housing is also less expensive than high-cost crisis care and emergency housing systems such as hospitals and shelters, and consequently saves tax payers' money. Units within the buildings are set aside for low-income residents of the neighborhood, enhancing the role of supportive housing as a community resource." permanent housing," said Commissioner Hess. "The supportive housing offered at projects like Diversity Works provide us with another option for families who need extra services to return to their communities and begin a new chapter in their lives." Diversity Works' service continuum was designed to help preserve and strengthen families dealing with substance abuse and was developed by the Lower Eastside Service Center (LESC) - a nonprofit that provides treatment and care for New Yorkers living with substance use and mental health issues - to initiate an effective and cost-efficient model of supportive housing for vulnerable homeless families with special needs. Diversity Works' tenants all will have access to vital services that include substance use supports, mental health services, vocational programs, case management and other resources to help them remain stably housed. Several Diversity Works families are also participating in Keeping Families Together, an innovative program that combines permanent supportive housing with family preservation services. The Corporation for Supportive Housing designed and implemented the new model with the support of the ACS, OHS, and several non-profit providers. Diversity Works 1s the first supportive housing site for families completed under New York/New York III (NY/NY Ill) and funded through the Department of Housing Preservation and Development's (HPD) Supportive Housing Loan Program (SHLP). NY/NY III is an agreement signed by City and State officials in 2005 to create 9,000 units of supportive housing for the neediest New Yorkers. HPD provided more than $6M for the construction of Diversity Works through its SHLP. Supportive housing provides individuals and families with services that help them overcome homelessness and disability to put their lives back on track. Residents are low-income, at-risk and formerly homeless md1v1duals or families, as well as people with chronic health conditions such as psychiatric illness, chemical dependency or HIV/AIDS. Supportive housing helps tenants seek and obtain employment, receive education and vocational training, access to health care and counseling, and develop money management skills. Tenants also have the opportunity to create a peer network and experience a stable home environment for which they pay 30 percent of their income in rent. The developments are often new construction and include on-site security, and the buildings are designed to match neighborhood density, scale and appearance. A recent study released by the Furman Center for Real Estate & Urban Policy, found that the value of properties within 500 feet of supportive housing show steady growth relative to other properties in the neighborhood in the years after the development opens. Since Mayor Bloomberg took office in 2002, HPD has funded construction of approximately 3,400 units of supportive housing in all five boroughs. DHS serves as the lead placement entity for families residing In NY/NY llI facilities, helping to identify and assist homeless families who meet the appropriate criteria with applications for the NY/NY Ill program. Approved applicants then are referred to the providers of the facilities. DHS also 1s responsible for the referral of applicants who come from outside the shelter system, such as substance abuse programs, hospitals or mental health facilities. “Safe and reliable housing helps people recover from a substance abuse problem or mental illness," said Health Commissioner Dr. Thomas R. Frieden. "Diversity Works is great step to help families who have struggled through homelessness and substance use to a healthier, more stable life." Keeping Families Together, the supportive housing model adapted by Diversity Works, integrates permanent supportive housing with coordinated child welfare services to prevent incidences of neglect or abuse, promote health and residential stability among both parents and children, and strengthen families' resiliency. Eligible families must be chronically homeless and have a high risk of out-of-home placement for their children. Keeping Familes Together is the first supportive housing model that has been deliberately designed to meet the multi-faceted challenges facing homeless and child welfare-involved families, including substance abuse. Keeping Families Together grew out of a request made by the Robert Wood Johnson Foundation to CSH to determine if supportive housing could preserve families and reduce harm to both children and parents by preventing relapse with intensive services and a family-centered environment. With the support of the Robert Wood Johnson Foundation, CSH worked with City agencies and non-profit providers to develop Keeping Families Together. Diversity Works is the fourth site to use the Keeping Families Together model. “Keeping Families Together is a response to chronically homeless families' complex needs, which often lead to higher incidents of child neglect or abuse and continuing involvement in the child welfare system," said ACS Commissioner John B. Mattingly. "Families who will benefit from this program are at a critical Juncture in their lives. By providing stable housing to a family in crisis, we can ensure that children grow up in an environment where they can feel safe and protected." "The Lower Eastside Service Center is extremely excited about our Diversity Works opening and appreciative of the vital support we have received from the City agencies, HHAP and CSH for our newest supportive housing complex," said LESC President and CEO Herb Barish. "LESC is very proud of how our new facility will enhance the local Bronx community by minimizing homelessness, substance abuse and unemployment, and bring more hope and promise to our residents’ lives"
"CSH celebrates the opening of Diversity Works," said Corporation for Supportive Housing New York Director Diane Louard-Michel. "CSH provided acquisition and early predevelopment funding, technical assistance, and most recently, the design of "Keeping Families Together': a ground-breaking demonstration program being implemented at Diversity Works. Diversity Works is a wonderful resource-to tenants who now have a place to call 'home', to the local neighborhood, and to tax-payers who invested in a humane and cost-effective solution to the scourge of homelessness among our children. This dedication ceremony is proof positive of what innovative non-profit organizations and visionary government officials can accomplish to prevent and end homelessness in New York." In addition to the approximately $6M funded through HPD, the Diversity Works development received $3.4 million from the New York State Office of Temporary and Disability Assistance (OTDA) through the Homeless Housing and Assistance Program (HHAP). HHAP was the first program in the country to target substantial financial resources to the development of homeless housing. HPD administered Low Income Housing Tax Credits which raised $2.8 million in equity from Enterprise Community Partners, Inc., which also supplied $12,000 in a predevelopment grant. The development also received $420,000 from CSH for acquisition and predevelopment costs. "I want to congratulate all our partners for their hard work in bringing this important project to the community," said OTDA Commissioner David A. Hansell. "The support services available on site for residents will help address and treat the root causes of homelessness, so that families can achieve and maintain the greatest level of independence possible. That is in keeping with Governor David A. Paterson's economic security agenda, which aims to provide vulnerable individuals with the tools they need to achieve and maintain their greatest level of self-sufficiency." "By providing access to decent affordable housing as well as supportive social services, Diversity Works empowers residents with the basic tools to improve their lives and enrich their communities," said Enterprise Community Partners, Inc. Deputy Director of the NewYork office Keith Fairey. "Enterprise is dedicated to continued neighborhood revitalization through projects like Diversity Works that are part of our Billion Dollar Promise to create and preserve affordable homes for 45,000 New Yorkers."